Aromas of bright raspberry, cranberry, dried rose petal, and crushed herbs arise from this deep garnet stunner. Flavors of lush black cherry, pomegranate, cinnamon and a hint of licorice glide across the palate with silky texture and medium weight. This one finished with a fruit forward profile. 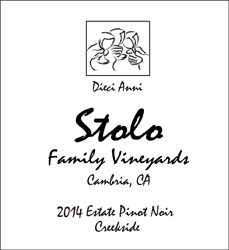 One of the moving forces in the effort to establish a new "Coastal AVA" in San Luis Obispo county, the Stolo family produces wines known for their sense of place. These "extreme coastal" vineyards produce wines with a distinct character. I hope you enjoy it as much as I do!